Medicare Prescription Program: We had a good turnout for the Medicare Prescription Program and hopefully you left with more answers to this complex issue. Thanks to Michele Lennon for arranging for the speaker. As usual we had lots of goodies to eat. Flu Shots: Thanks again to Michele Lennon for a fantastic job getting over 100 residents from Lakeside Terrace and Griffwood processed so quickly. Looking at all the people in the clubhouse waiting to get flu shots - we thought we would be there all day. Everyone had their flu shots and the clean up was done by 11 :30. A number of residents have approached me about the split ticket prices for events. So I guess we have to address this issue once again. For those of you who are new to our community I will give a brief explanation. Prior to November 2004 non-social club members were charged $1.00 more for event tickets (ie. New Year's Eve, Valentines, St. Patrick's and entertainment shows). The previous Board proposed a change in that policy -charging non-social club members 150% of the price of a ticket for a Social Club member (if Social Club member paid $3.00 then a non-social club member would pay $4.50). This change was voted on and passed. I realize that we will never make everyone happy but I think we can come to a more agreeable solution. What I would like to suggest is that we have a committee meet to discuss the issue, get information from other Social Clubs on how they operate, and come up with ideas to present to the membership. I would like to see Social Club members and non-Social Club members on the committee so we can get input from ALL residents. If you don't feel a committee is the way to go then another suggestion would be to have residents submit suggestions. This could be done by putting your suggestion in the Social Club box in the clubhouse. We don't want to have a long discussion on this issue in December - we just need to know how you want to proceed with this - committee or suggestions submitted to the Board. as President of the Homeowners' Association. This decision was made due to personal and health reasons. Charlie Barcus is 1st Vice President and will assume the duties of the President until January when the membership elects new officers. Whether you agree or not, I gave my best to the job and tried to keep you informed. Please give Charlie and the other officers your support. > Approved seed money: Thanksgiving - $150; Chili Light Up - $200; Toys for Tots . Christmas Party - $150; Home Alone Christmas Dinner - $250; Casino Night - $300; and Come to the Islands Party - $650 for entertainment. > Allotted up to $200 for two printings of our directory (one in early December and another in February or March). If your information is not included or correct in the fIrst edition of the directory, please contact me at 728-8121 or e-mail me at cakolbe@yahoo.com. > Authorized disposal of copier when the maintenance contract expires in April. > Care Packages for Military: Packages for Military: Several residents will be researching this project and report back in January. Crime Prevention Program: I would like to extend my apologies to everyone who showed up for the Crime Prevention Program on the 12th - unfortunately the speaker didn't show. I do have a contact at the Lake County Sheriff's Office. I will try to get a presentation scheduled with them. I still feel this is an important topic and am hopeful that you will come back for free coffee & donuts. 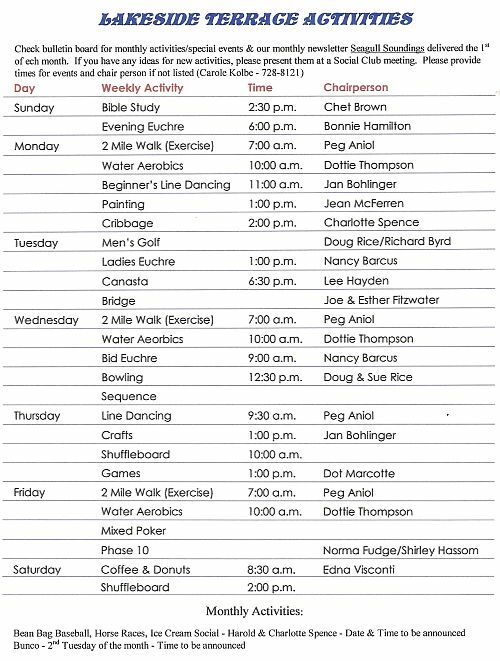 When a program is scheduled the information will be posted on the bulletin board and in the Seagull (time permitting). Again I apologize for any inconvenience this may have caused you. TUESDAY, DECEMBER 6, 2005, AT 7:00 P.M. WELCOME: We would like to welcome our new neighbors: Conrad & Mary McMonigle at 75 Lake Griffin Drive, from Ohio; Lawrence & Rachel Miller at 26 Driftwood Lane, from Michigan and James & Gwen at 14 Island View South, from Lakeland, Florida. We are looking forward to meeting you all at the coming events scheduled in December. The "Beginning Drawing & Painting" class now meets every Monday afternoon at 1 p.m. at the clubhouse. We will meet Dec. 5 & 12, then not again until Jan. 9. You may join at any time. For more information call Jean McFerren at 728-1657. We will be holding our annual "Tag sale-Craft Sale-Bake Sale-Lunch" the first weekend in February. On Friday evening the tag sale only, is open to our park residents. On Saturday the public is invited. We get a pretty good crowd so be saving all those items you wish to sell till then. You may rent a table for $3, or donate baked goods. We will be serving lunch and also have more crafts this year. For more information call Jean McFerren at 728-1657. Please save the tops of spray cans to be used in a craft project. We plan to make miniature flower arrangements to take to the nursing home in the spring. They can be placed in the box in the laundry room. There is a basket in the laundry room for donated canned goods which are then taken to the food bank to be given away. Thanks so much for sharing with others. 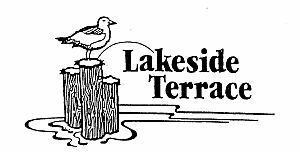 Lakeside Terrace residents would like to say thanks and offer a pat on the back to Marvin and Faye Adams and their committee for the excellent job they did in preparing and serving our community Thanksgiving Dinner. The food was delicious and a good time was had by all. Thanks to Shirley Hassom for the beautiful Christmas Bulbs wreath she made for our Crafting Thanksgiving raffle. The lucky winner was Charlotte Vique. Wrapped-lighted jars - will be done on Dec 8th sign up sheet on clubhouse bulletin brd. FYI: Be sure to check out Jean McFarren's drawing class on Monday afternoons. We are also trying to arrange ceramics to be held on Thursday afternoons. Need to know if there is an interest. Swedish weaving - is every week so if you want to learn we have Sample Kits for $4.00 See Shirley Hassom. Christmas bracelets & pins to make are still available @$2.00 each see Sally Cannon. Keep your eye on the clubhouse bulletin board for more exciting craft news. To enable us to share Christmas greetings with our Lakeside Terrace neighbors, there will be a spot designated on the wall by the mirrors with tacks provided so that cards may be put up. We will be looking for your Christmas card! TO OUR NEIGHBORS WHO WERE ILL OR HOSPITALIZED RECENTLY, WE WISH FOR YOU ALL BETTER DAYS AND HEALING TOO COMBINED WITH GOOD CHEER AND STRENGTH, IN NOVEMBER, GET WELL OR THINKING OF YOU CARDS WERE SENT TO MARY KARWASINSKI, MARVIN ADAMS, JOE HURLEY, THERESA LAPOINT, LOREN FOOTE AND MR. AND MRS. JAMES BUCK. We offer our sympathy to Mr. and Mrs. Charles Matias and family for the loss of Charles' father. THANKS: Many thanks to all of you at Lakeside Terrace. All of your calls, cards and concerns were appreciated so much and I know helped speed my recovery. Soon it will be goodbye cane! Ice cream social, Friday, December 2nd at 1:00 P.M.
Saturday, December 10th at 7:00 P.M.
Come and join us at "Lakeside Terrace" Downs and cheer on your favorite horse (bring quarters for wagering). Betting windows open at 7:00 P.M. sharp. First race at 7:15 P.M. Since we have a lot of new residents, thought this would be a good time to explain what the Social Club is and what we do. The purpose of the Social Club is to provide social activities for ALL. Maintain and purchase equipment for Social Club activities. Promote the spirit of loyalty, cooperation, happiness and fellowship among ALL. I didn't realize until I became an officer how much equipment we have and all the activities that are provided by the Social Club. We have bingo equipment, audio equipment, kitchen equipment, ping pong table, piano, organ and keep up the maintenance on our equipment. We maintain the library, stage, pool table, and shutl1eboard courts. This things require money. The membership dues we collect are used to purchase and maintain these items. We also need money to provide the weekly activities and monthly events. Membership is only $12 per year per person - that's less than 4 cents a day. I realize that some people just don't join things but I think all residents need to be aware that the membership dues and the tickets sold for events allow us the opportunity to provide so many activities for our community. The Social Club is a big selling feature when people are looking at homes in our community. Show your support of this community and join the Social Club. Once a member it is your choice how involved you become. December 6th Chili Light Up Doors Open at 5:45p.m. 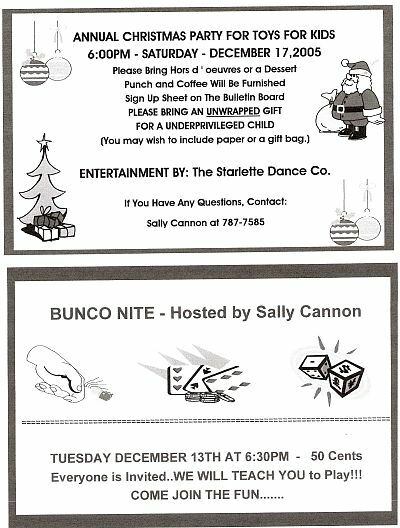 Social Club Meeting 7:00 p.m.
December 13th Bunco 6:30 p.m.
December17 th Christmas Party/Toys for Tots 6:00 p.m.
December 25th Christmas Dinner 1:00 p.m.
11/8/05. Thirty-five people were in attendance. Thank you Carol for being there and getting the coffeepot perking. The Flu Shot Clinic sponsored by the Lake County Health Department with the assistance of the Lake-Sumter Emergency Medical Services, gave 100 Flu shots as well as numerous Pneumonia and Tetanus Toxoid shots, on Monday, 11/14/05. Many thanks to Frances Weston R.N.C. and her staff from the Health Department as well as Deanna Chapman and E.M.T. 's who gave the vaccines. Sincere appreciation to Pat Voelker, Mary Sullivan and Peg Aniol for taking care of registration. And also to Jean McFerren, who made sure everyone had the proper paperwork before lining up for their shots. Special thanks to Ruth Mosman and Carol Kolbe for keeping the coffee and refreshments going. Our apreciation and thanks also to Veda Lemcke, Carol Kolbe, Pat Voelker, Charlotte Spence, Judy LaQualia, and Ruth Mosman for donating the baked goods. We are grateful to Wally Voelker, Jim McFerren, Harold Spence and Frank Hamilton for being available to assist, if needed, in parking and entering and leaving the Clubhouse. The Seagull Staff wishes each and everyone a very Merry Christmas and a Happy New Year and advises because of traveling staff members, your January Seagull may be a "little" late. The cut off date for submitting articles remains the 25th of the month. DINNER 1:00 P. M. DOORS OPEN 12:30 P.M. GIFT EXCHANGE OPTIONAL NOT TO EXCEED $5.00, MARK GIFT FOR "MAN" - "WOMAN" - "UNISEX"